“Now that’s got a good kick” is a phrase you hear a lot in our house. My husband and I are rather partial to hot, spicy food you see. We are complete chilli fiends. Even our children like things nice and spicy, especially our oldest, Jessie, who enjoys hot chilli sauce on pretty much anything. Chilli with chocolate is a favourite combination; they really are a match made in heaven. We’re forever trying out different chilli chocolate bars and generally complaining they don’t have enough of a kick. I was thinking about coming up with my own chilli chocolate creation when I came upon this cookie recipe in The Red Hot Chilli Cookbook by Dan May. I couldn’t resist. Dan’s recipe calls for stem ginger, but I didn’t happen to have any in. Instead I found some dried cherries in the cupboard and opted for those, as much for the charming alliteration as anything else. 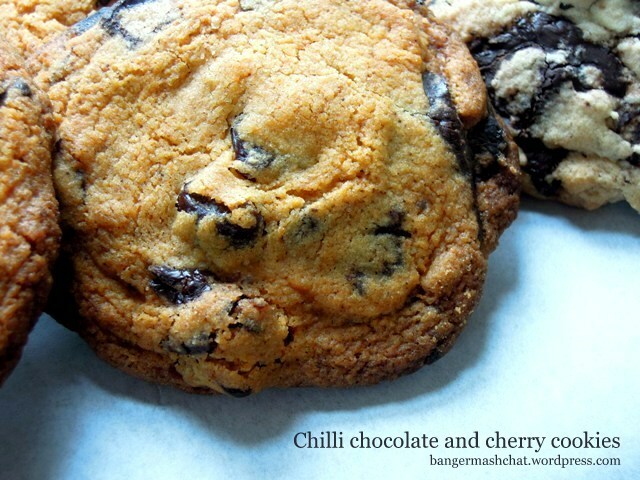 If you like chilli and chocolate, you really must give these cookies a go. They are absolutely delicious and very, very moreish. The sweet, chewy cherries and big, fat chunks of richly bittersweet chocolate contrast beautifully with the savoury, fiery bursts of chilli heat. They were a little too hot for Mia, our five-year-old, but I’d made her a version using ground ginger instead of chilli, which suited her. But Jessie loved the chilli bad boys as much as her parents. Sift into a large bowl the flour, baking powder and chilli powder and stir in the sugar. Add the butter, vanilla extract and milk and mix together to form a dough. Next add the chocolate and cherries and combine well using your hands. Divide the dough into eight balls and squash down a little until they are about 6cm in diameter. Arrange on a baking sheet covered in greaseproof paper. 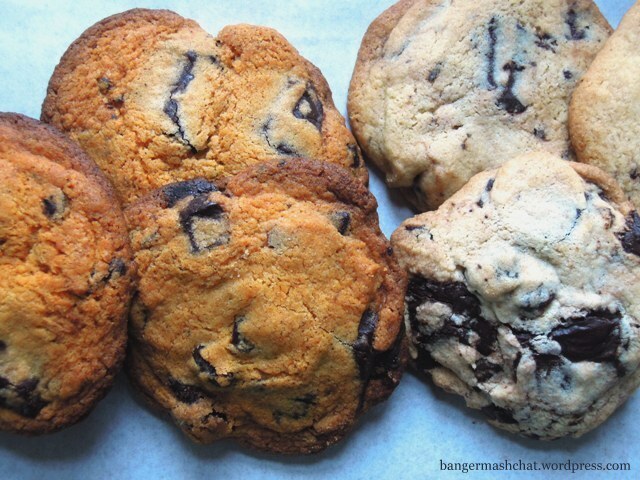 You may need to use two baking sheets, as the cookies will spread a little as they bake. Bake in the oven for 10 to 15 minutes until the edges are just beginning to turn brown. Leave to cool and firm up on the baking sheet for a few minutes before transferring to a wire rack to cool completely. Dan May says to enjoy them with a big mug of tea, but I liked mine with strong coffee. And apparently they will keep for a few days in an airtight container but ours didn’t last that long. If you do need to bake a non-chilli version, simply substitute the chilli powder with a teaspoonful of ground ginger. Loving the sound of these cookies! Thanks Sam, and thanks for stopping by. They are rather special! I have a friend who loves Chilli chocolate, i will have to bake some of these when i next see him. Chill and chocolate has to be one of the best flavour combos there is – and your cookies look like a really good way to use it! I love the chocolate chilli combination and I bet it’s even extra awesome with the cherry. Oh yes please! 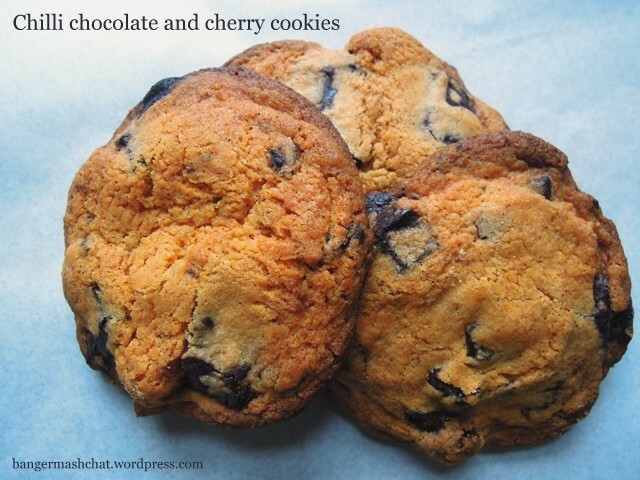 Those look like picture perfect cookies and I love the idea of chilli, chocolate and cherry as a combination.